By using an EHR template to more effectively gather family histories, a California health system has been able to send patients on a path toward better health. Family health history information is an effective and accurate tool for assessing an individual’s risk of developing various diseases. Healthcare providers who collect and evaluate this data in clinical care settings can identify high-risk patients and encourage them to seek genetic consultation, take precautionary measures such as early and frequent screening, and make behavioral and lifestyle changes. In particular, family health history assessment has proven to be an excellent genetic screening test in cancer cases, so much so that it is considered the gold standard for initial assessments. To help promote this important health tool, several federal agencies and professional organizations have developed comprehensive online programs that allow patients to collect, record, and organize their family health history and share it with doctors. EHRs are viewed as an important vehicle for gathering family data that can be used to improve patient care and lower costs. 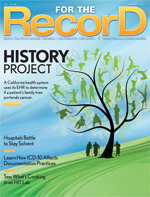 One healthcare system has chosen the EHR route to get a head start on identifying at-risk patients. The VA Greater Los Angeles Healthcare System (VA GLA) has developed and implemented an education program designed to improve familial risk assessment for two common hereditary cancer syndromes: hereditary breast-ovarian cancer and Lynch syndrome. The goal is to increase family history documentation and appropriate referrals for genetic consultation. VA GLA providers collect the information using a template designed specifically for the VA’s VistA EHR. Developed by Maren Scheuner, MD, MPH, director of the Health Services Genomics Program and clinical genetic services at VA GLA, and her colleagues, the program has resulted in better cancer family history documentation, improved recognition of patients at risk for hereditary cancer, and increased referrals for genetic consultation and testing. Seven primary care clinicians, who see about 4,000 patients per year at the VA GLA’s two women’s clinics, are participating in the three-year project. Its components are informational (a website and a continuing medical education-approved lecture series for clinicians), clinical (patient and provider information sheets and a family history reminder within the EHR template), and behavioral (practice feedback reports regarding clinicians’use of the EHR family history reminder). During the first five months of the project, clinicians captured 568 cancer family histories, including detailed data that would not have been previously documented but is necessary to recognize high-risk patterns. As a result, 47 patients have already been referred to the VA GLA’s genetics consultation service for risk assessment and possible genetic testing—referrals that quite possibly would not otherwise have been made. Of the various program components, the EHR cancer family history reminder and template appear to be having the greatest impact on encouraging clinicians to systematically collect family history information. The template’s opening page asks clinicians to click “yes,” “no,” or “don’t know” to seven stem questions. One question is “Were any first-degree relatives (parents, siblings, children) affected with cancer?” If yes is clicked, another window opens asking the clinician to select the type of relative, the type of cancer, and the age of onset. When the patient has little or no family history of cancer, the clinician can quickly click through the template. Even when there are yes answers, it takes only a couple minutes to complete all the information. • Patient declines genetic consultation for cancer. • Genetic consultation for cancer not indicated. Since VA providers have used the VistA EHR since the 1980s, the participating clinicians were familiar with similar templates, along with the electronic reminders to complete them. No technology training was necessary. However, prior to introducing the clinical tools at the women’s clinics, Scheuner’s team pilot-tested them with other VA GLA primary care providers. Feedback was used to develop the most effective design for the template and information sheets. The patients who participate in the program are not specifically selected but are individuals who have regularly scheduled appointments at the participating clinics. During check-in, front office staff provide them with a family history questionnaire they can complete while waiting to see the clinician. Seeing the reminder to complete family history information in the “active reminder” list in the patient’s medical record, the clinician then reviews the questionnaire completed by the patient and verifies the information while clicking off answers in the template. When patients do not have time to complete the questionnaire, the clinician asks the questions during the appointment. On occasion, patients are preoccupied with their complaints and decline to participate, in which case they may be asked again at their next visit. While an assessment of patients’ reaction to the program is not part of the study, the patient questionnaire was piloted with veterans through the VA’s Patient Education Resource Center to ensure appropriate wording and language level. “The questionnaire was readily accepted by the veterans in the pilot who stated that they were accustomed to sharing family history information with their providers,” says Scheuner. To introduce clinicians to the program, over a period of seven months Scheuner conducted a series of monthly lunchtime lectures at the two participating clinics. Case based and interactive, her presentations focused on the importance of recognizing patients with an increased risk of developing certain cancers. Participating providers were also personally contacted to ensure a good understanding. The initiative includes multiple modes of quantitative and qualitative evaluation methods to assess changes in clinician behavior. Quarterly behavioral practice feedback reports show how many patients each provider saw for whom a reminder to document family history was due, how often the clinicians completed the task, and whether they made a referral for genetic consultation. Each month, the EHR generates reports based on variables created in the database when a template is completed. Scheuner reviews the reports to assess a particular patient’s family history and whether a referral was made for genetic consultation. Another source of data is a random sampling of patient charts from the participating clinics. Whether or not templates were used, Scheuner’s team reviews patient characteristics and checks whether family history was documented and which family history elements were included. When Scheuner’s team examined a random sample—10% of all the charts of patients seen in the women’s clinics during each month before and after implementation—the results seemed disappointing. Thirty-two percent of the charts still showed no documentation of family history, and 18% had only a brief notation of “family history of…” that failed to specify the type of relative who had cancer. The other half of the charts, however, did provide some detail about family history. In reviewing those charts with more specific documentation of family history, the program’s success was evident. After implementation of the EHR reminder and template, much more detailed family history was documented. Sixty-nine percent of the charts recorded a family history for second-degree relatives and 54% for third-degree relatives postimplementation compared with 33% and 5% preimplementation, respectively. Digging deeper, 68% of the charts reflected the lineage of relatives compared with only 15% before the intervention. Documentation of age at cancer diagnosis was up from 19% to 88%; Jewish ancestry (significant for certain types of cancers) was recorded in 64% of the charts (compared with zero previously); and genetic consults were indicated in 10% of the charts (compared with none before the implementation). Scheuner would like to expand the project to other primary care clinics and perhaps to oncologists at the VA GLA—where more than 80,000 patients are seen per year—to incorporate a more diverse population. A multisite study with a control group would also be useful to assess outcomes more rigorously. Another one of Scheuner’s goals is to collect behavioral health outcomes of the patients who were part of the study. She also plans to implement telemedicine, currently used at many of the VA’s clinics, to facilitate genetic consultations for patients in her region. EHR vendors, too, need to step up and develop modules that facilitate the documentation of detailed family health histories. Unfortunately, Scheuner says, most EHRs fall short of providing efficient tools to systematically document such information. While some programs have a family history tab where clinicians can enter some basic data, many providers find it easier to type brief notations in the progress notes. If healthcare professionals are to effectively collect useful, comprehensive family health histories, Scheuner says they need tools that do not disrupt workflow. They also must be educated on the importance of documenting this vital information.